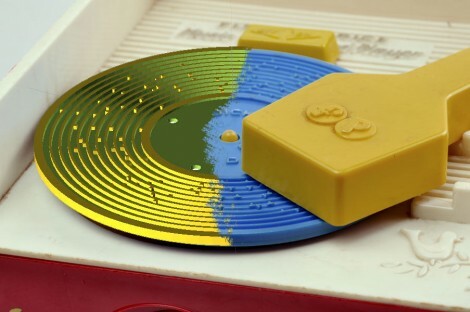 [Fred Murphy] went ahead and revised his method of making custom records for a Fisher Price toy record player. He’s now able to 3D print the discs. The toy works much like a music box, with a comb in the “cartridge” of the record player and notches in the record that pluck the fingers of the comb as it turns. He had previously developed a subtractive method that let him mill records out of a solid piece of plastic. But this additive method means less waste. The music creation portion of the project is the same as the previous version. That’s because it’s pretty hard to outdo the C# software he wrote which serves as a composition studio. The difficulty comes in getting a clean print for the disk. The ridges on the discs are 0.7mm so you’re going to need a well-aligned printer with fine resolution. [Fred] printed in both ABS and what he calls “Vero clear” plastic. The former works but he got better results with the latter.